Lady Gaga certainly has a way with words. Her hotly-anticipated second single from Born This Way, titled "Judas," premiered on iTunes for digital purchase Friday, four days before its scheduled due date. 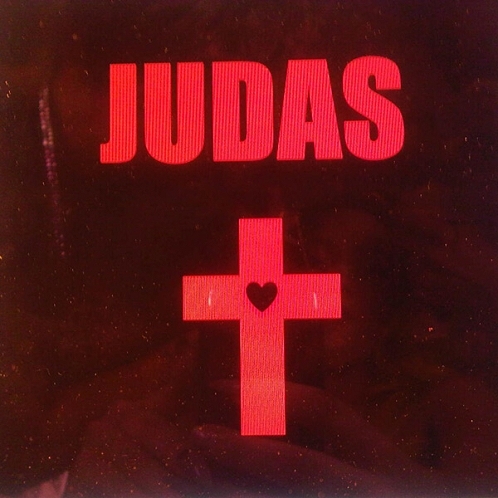 In the song, she sings in the perspective of New Testament figure Mary Magdalene, who has an affair with Judas, though she is in love with Jesus. The lyrics of the single add to the controversy of its visual. In an interview with MTV UK, Gaga's creative director Laurieann Gibson announced that Gaga would portray Mary Magdalene in the video, which was shot earlier this month. In response, Catholic League for Religious and Civil Rights President Bill Donohue issued a statement, saying that Gaga has no talent and that the premiere of the video "isn't random, we are getting closer to Holy Week and Easter." Gibson, who is a devout Christian herself, said that the song is not blasphemous and that if it was, she would have walked away from the project. SIDE NOTE: Hey guys! Could you do me a huge favor and click the "Vote" button on the purple widget on the sidebar (at the top)? I'm competing in a sponsorship contest with Prilosec OTC and the more votes I get, the greater my chances are of winning. I would really appreciate it. Muchas gracias! !